Peter’s Pressure Washing serves all of Tampa Bay area with professional and competitively priced gutter cleaning services We are a full-service pressure washing company specializing in Gutter Cleanout and gutter whitening techniques. We aim to lengthen the lifespan of your gutter system with optimal performance. Our team of gutter cleaning specialists has years of experience and the right skill-set that opens clogged gutters in no time. Gutters serve an important function for your home, however, they aren’t very useful when they are clogged and packed with leaves, sticks, and other debris. When we perform a full gutter clean-out and flush we start by removing the debris from the gutter. Gutters, when neglected, can get clogged with leaves, sticks and other unwanted debris. As a result buildup rainwater can seep down through the interior and exterior of your home. Standing water also results in being a breeding ground for mosquitoes, pests, critters, rodents, and mold which further cause disease and infestation. 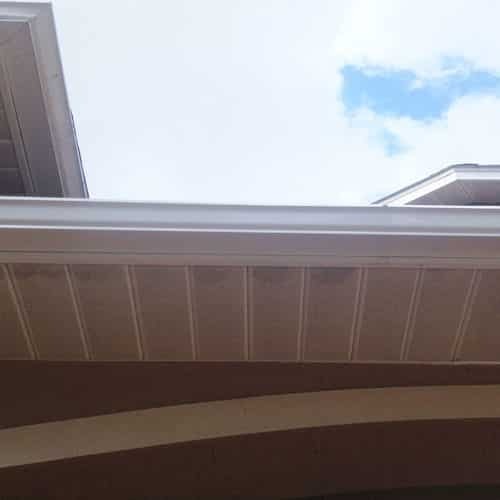 Having a well-installed gutter system is essential to the structural well-being of your residential establishment as it helps guide rain and stormwater off the roof, walls, and away from the foundation. Fully functioning gutters and downspouts preserve not just your premises but also the surrounding neighborhood. This is done either by scooping the debris out by hand, jetting the gutter with our pressure washer, or both depending on the situation. Once the gutters are cleaned out we will jet the downspouts to ensure that the whole gutter system is draining properly. Lastly, we will do a final clean up on the ground to rinse down any splatter. At the customer’s request, we are happy to take before/after pictures of the inside of the gutter to prove the job has been completed correctly! Gutter clean-out is an important maintenance that should be completed regularly. If you’re not comfortable putting yourself at risk for this often messy job, then call the pro’s here at Peter’s Pressure Washing! Peter’s Pressure Washing specializes in gutter cleaning and gutter whitening in Tampa and the surrounding area. Have you ever noticed those ugly black streaks on your gutters? Or the fact that your gutters just aren’t white anymore, but more of a light or dark gray color? If you’ve ever tried, you’re sure to have found that mere water pressure (no matter how strong) won’t touch the black streaks and gray haze. That’s because those stains are caused by oxidation. The best way to clean out rain gutters is by pressure washing them. It requires a special cleaning solution as well as the right application/agitation in order to remove the stains. We specialize in this process and have successfully performed it again and again. 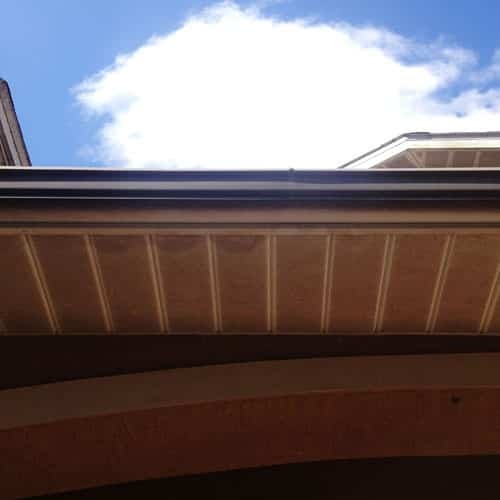 Many homeowners have been told, “The only way to get rid of those black streaks is to paint the gutters” or “Sorry, but those just don’t come off…” but it’s not true! You will be amazed at the difference that shiny white gutters makes on the curb appeal of your home. Don’t settle for less! Peter’s pressure washing offered top notch service from initial contact and after work was completed. I am very satisfied with their service. Yes, you may be able to find a random pressure washing company on Craig’s list for $20 less, but quality of work, services and professionalism are 10/10 with this company. Let our pressure washing experts save you the hassle of climbing heights to carry out this mundane task. A thorough gutter cleanup by our team begins by removing all the accumulated debris. Depending on how clogged the area is, a combination of scooping the debris out by hand and gutter flushing is incorporated with a pressure jet. Then our team jets the downspouts ensuring the gutter system is drained properly. A final clean-up of the ground is undertaken to rinse off any unwanted splatter. We love to take before and after pictures of the gutter for your complete satisfaction. Our experts also recommend regular maintenance of your gutters to save costs incurred from damage. Reach out to the experts at Peter’s Pressure Washing to help ease your drainage woes. Look at the reviews from our many satisfied customers!